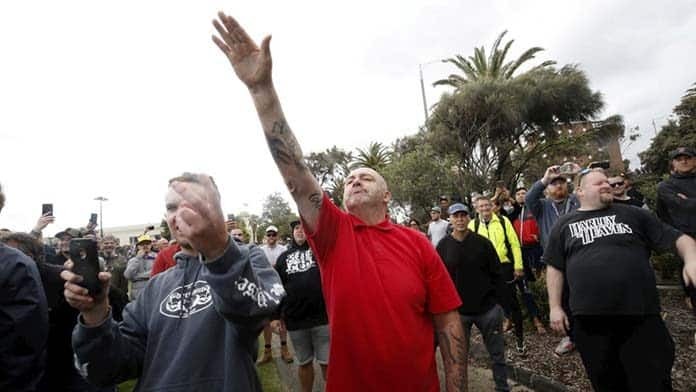 In early January 150 racists and fascists gathered at St Kilda beach in Melbourne, boasting that it would be “Cronulla 2.0” where they would “reclaim the beach” and recreate the racist riot of 2005. Neil Erikson and Blair Cottrell, both active in stirring up racist bigotry against Muslims as well as self-declared admirers of Hitler, organised and led the event. A number of those at the rally openly displayed their fascist politics, with one caught on camera carrying an SS helmet, and several giving Nazi salutes. In the immediate lead-up to the rally, Antipodean Resistance, a neo-Nazi group associated with Cottrell, plastered swastikas on a Jewish aged care centre in Caulfield. Disgracefully, Senator Fraser Anning, who recently called for a “final solution” to Muslim immigration, was a keynote speaker at the event, charging taxpayers $2800 for a business class flight to be there. In the aftermath, even Prime Minister Scott Morrison and the Murdoch press distanced themselves. But it has been the mainstream media panic about “African crime” and the racism from the Liberals against the Sudanese community that has given the far right legitimacy. Media reporting of several incidents in December played a large role in circulating racist myths about a “crime wave” on Melbourne’s foreshore. The media again blamed the African and Sudanese community, by focusing on one particular incident involving up to 20 young African men. Channel 7’s A Current Affair on New Year’s Eve was particularly repulsive. It broadcast a segment titled “The ‘race war’ brewing on Melbourne’s streets”, featuring an interview with Neil Erikson (where the interviewer failed to mention Erikson’s convictions for racial vilification and other offences) and a masked “Vietnamese teenager”, who called on people to “hurt any African youths” they see. The week before the rally, Erikson and his supporters found yet another opportunity to stir up racial tensions by filming and harassing African youth playing soccer on the beach, sparking a stand-of between the groups. An anti-fascist counter-demonstration of around 300 people successfully opposed the far right rally on the actual day, both outnumbering and drowning them out with anti-racist chants. It was important that their protest was challenged. Counter-demonstrations make it harder for the far right to organise by exposing their racism and fascism for what it is. But to effectively stop the far right we also need to challenge the racism in the political mainstream that has legitimised them. The Liberals’ Peter Dutton and Prime Minister Scott Morrison have helped conjure up the panic about African crime in order to provide an effective scapegoat and a distraction for their party’s unpopular anti-worker agenda. Dutton claimed, ridiculously, that Victorians were afraid to leave their homes to go out to restaurants because of African gangs. Then leader of the Victorian Liberals, Matthew Guy, echoed this rhetoric, campaigning on a tough-on-crime agenda in the lead up to November’s state election. The Liberals’ humiliating defeat in the election was a welcome rejection of this politics of fear. But Victorian Labor Leader Daniel Andrews also made concessions to it, toughening bail laws and attempting to introduce racist anti-association laws that would’ve granted police expanded powers to prevent people as young as 14 from associating with those convicted of serious offences. In the end the anti-association laws were quietly dropped following a backlash. The media has not only fanned the law and order panic but often directly given the far right a platform. Last year, Cottrell was invited onto Sky News as a “right-wing activist”, after previously being interviewed on Channel 7 and ABC’s Hack Live. As the federal election approaches we can expect more racist fearmongering from the Liberals. Building the anti-racist campaigns against the fearmongering against the Sudanese community and to welcome refugees will remain crucial.